Fifteen years ago eighty-year-old Luthando Dyaban’s family did not benefit from an extensive social grant system and did not own their own home. But now Dyaban explains how his nine grandchildren are all able to draw a state child support grant and how his rental home has been transferred to his ownership. On the other end of the age spectrum, Sibongile Nkanu, 18, has lived in an informal settlement for the last eight years. For the first two years, she said, there were no services, but now there is water and sanitation and the area is cleaned regularly. Both Dyaban and Nkanu – the old and the young – have concerns about whether the ANC will deliver, but feel that the party has done enough to earn their vote when polls open on Wednesday. 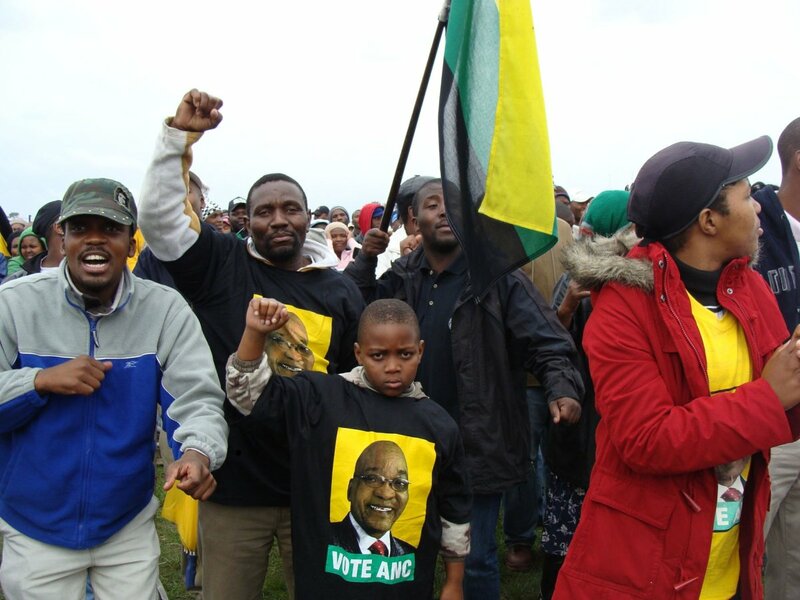 The two were part of a crowd of about 10,000 people who ignored cool and rainy weather in the Mother City to turn up at the Nyanga Rugby Stadium in Cape Town for the Western Cape leg of the ANC’s nationwide Siyanqoba Rally on Sunday (19/04/2009). The Nyanga rally saw the crowd watching two big screens that showed proceedings from the massive Johannesburg rally via satellite. The rally followed hot on the heels of the final election rallies of both the DA and COPE in the Western Cape on Saturday. Opposition parties, with the DA leading the charge, are hoping to wrest control of the Western Cape from the ANC. At the Nyanga stadium, ANC president Jacob Zuma’s speech from Johannesburg received the loudest cheers for his comments on education, although at one stage both screens at the ground went blank, leading to loud boos from the crowd. Zuma promised free and compulsory education and an increased number of no-fee schools. The ANC would make sure that learners and teachers were in class on time and had the material they needed. Dyaban, who applauded Zuma’s speech, said he had been with the ANC “since he was born” and would not go to another party. He said a vote for the ANC did not necessary mean a vote for Zuma as the future president was merely an employee of the party. He said COPE would not attract his vote as those who had left the ANC should have discussed their problems within the party. The ANC had done much since 1994, he said, but still needed to do more as many people were still unemployed. But there were “priveldges” like social welfare grants that had not been there before. Nkanu, who lives in Lusaka informal settlement in Nyanga, said she was voting for the ANC because it was the party that had liberated black people from oppression. Voting for another party like COPE would be a “betrayal” of those who had fought for democracy. Kanu wants the ANC to eradicate informal settlements by 2014, but is most concerned about education. She hopes to become an accountant when he finishes Grade 12, but is worried about the cost of higher education. Since 1994, she believes not enough has been done on education, with many learners dropping out of school early.